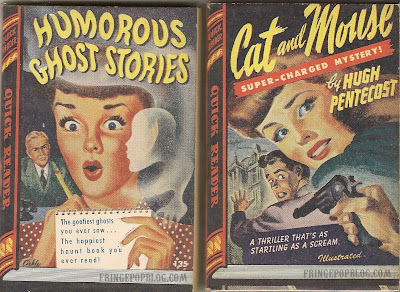 Quick Readers were a short-lived miniature paperback book series. They were put out in the 1940's and only about 49 books were printed in the series. Each Quick Reader measures approximately 4.5" x 3.25" and contains illustrations plus abridged text. These tiny little books were perfect for the war-time 1940's in which paper had to be conserved. These books are so tiny, they look small even in the hands of a child, and that just adds to their charm. Here are four "Quick Readers" from our collection. Note the "Japanese menace" element on "Bushido." Poe-iana works for me. Some older collections of EA Poe stories feature great graphix. Tim Burton's first flick was animated Poe (actually sort of hamfisted)--I've seen a pretty cool version of Fall of the House of Usher (there's quite a bit on youtube). The french symbolists such as Baudelaire loved Poe as well. Masque of the Red Death is one of my faves. 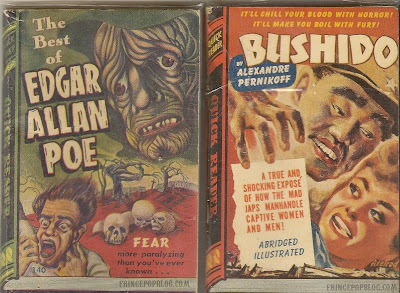 The V. Price Poe flicks,a bit kitschy perhaps, still move me as well--and quite horrifying really (at least Pit and Pendulum was). Poe: sort of All-American goth. Giant Ants Attacking! Oh My!